Kirsanov.net | My First App For Android! My First App For Android! It finally happened. My first app for Android platform is just about to be released and is available in Beta channel. It was clear that I’m not going to release anything for Windows Phone market anymore, especially since all phones in family are Android based, but I had to start somewhere in Android, and what a start it is! The idea came during the Halloween night, when I was about to pick up the trick-or-treaters and their parents from neighbourhood. The problem was – it was night, I didn’t know where they are at the moment, and they were wandering among other spooky wanderers. I needed to know their location, precise and fresh. It took a few phone calls and messages with coordinates until I found them. Not a big problem, but I would rather get rid of that. Second problem was recurrent – when I have to pick up someone using the car, I want to make sure that person knows my whereabouts, so neither of us would have to wait. Or when I want to show where I am, so family would know when to expect me. And that I’m fine and where I am supposed to be. And a nuance – I never want this information to be available all the time. For various reasons – from privacy to battery life of my phone. I want to press the button, share my location, and for a limited time I want that location to be current. And that’s how Locacio was born. The name means “location” in Catalan, and the main reason for such name is that other names are taken, mainly by squatters. It’s hard to find a word in English vocabulary that wouldn’t be taken by someone with desire to re-sell. 1. Dropdown list that allows you to select the time period to share your location, currently it’s from 30 minutes to 3 hours. 2. The PIN switch. I never had to use it in practice, but it’s here just in case. Once you press it, the app will generate a 5-digit pin that would be required to access your location. 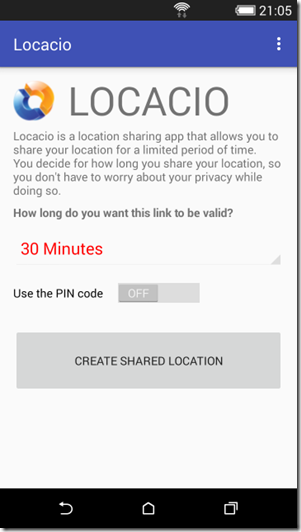 The idea is that if someone will use the link to your location while it’s still valid, the required pin code could prevent it. 3. The BUTTON. You press it – the app starts working. It will connect the server, create new “Share”, then generate the link (web url) that recipient should visit in order to follow your location. Then it opens the sharing dialogue, that will list your messaging and text saving apps – SMS, Telegram, Skype, OneNote, whatever else. If you won’t be able to share the link (e.g. press Cancel or share it not where you wanted), there is a menu in main window, that allows you to re-send the same link once again. 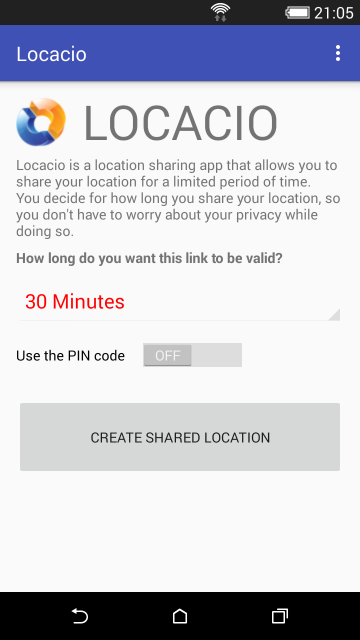 The app will then tell you that it’s sharing your location, and the same button that is creating your share, will allow you to cancel it, if you want to stop it earlier. The recipient doesn’t need the app. Because what they receive is a web url. 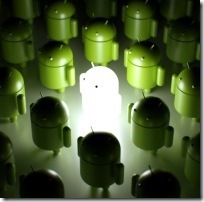 They just visit it, and see a mobile-friendly web page, which updates twice a minute. There is no registration. The app is totally anonymous. You can set the “handle”, which is like nickname, but it’s not registered on server, so anyone else can use it. It’s not a social network, so such collision isn’t a problem – after all, when you are sharing the link, your recipient knows where it’s from. When you press “Stop sharing” button, the application actually exits. Not only it stops updating your location, but also taking any resources at all. When your battery is low, app will wait until you connect your charger. Current limit is 15%. App uses custom, presumably very efficient algorithm to get your location, trying to keep the precision while not wasting energy. App is very data-friendly. If you stop, your location isn’t updated. So it can be used in roaming as well. If you restart your phone, just re-launch Locacio, and it will pickup where it stopped. And here is the website of the geolocation app.